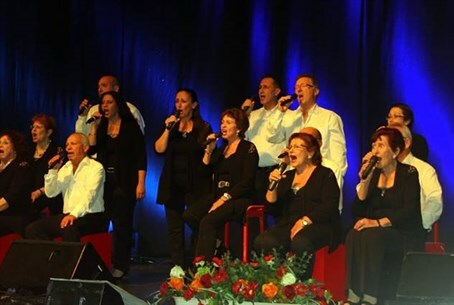 The iconic folk singing troupe Gevatron, which represent the secular socialist kibbutz movement and has been famous since the early years of the modern state of Israel, arrived Wednesday to perform for elderly citizens in Ariel, Samaria - despite it being over the "green line." Gevatron was founded in the kibbutz Geva in the Yizreel Valley, with members of the kibbutz largely seen as having a leftist socialist worldview. Nevertheless, the band performed for the 450-strong audience in Ariel's cultural center where they received a warm welcome. The performance was part of a series of events held for elderly citizens in the Binyamin region of Samaria and Beit El at the Ariel cultural center. In the first part of the evening's events, the elderly honored Jewish agricultural work in the region from before the state's founding up to the present day, learning about how thriving wine vineyards have been regularly winning awards of excellence in Israel and abroad. Afterwards Prof. Zohar Amar spoke about the archaeological findings in Neve Tzuf in Samaria that shed light on historical agriculture in the region. And then Gevatron performed; their decision to agree to perform over the 1949 Armistice lines surprised some given the band's association with a movement identified as leftist-leaning. The band's announcer paused the performance at one point to relate an incident that happened when they arrived at the Ariel cultural center and started getting off their bus. They were asked immediately whether it bothers them to perform in "settlements," and how they agreed to do so. "It's not even a question," she said the band members answered. "Music connects people, and bridges between opinions. We are one people despite the different opinions." The members went on to say how they enjoyed performing in the "capital of Samaria," as Ariel is known, and that they appreciated the warm reception.